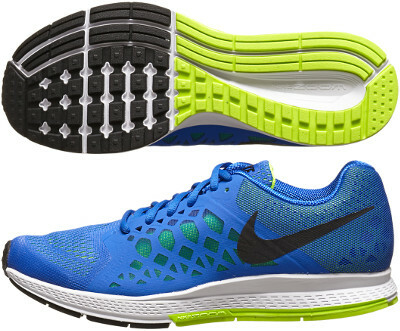 Nike Zoom Pegasus 31 are neutral cushioned running shoes. Nike Zoom Pegasus 31 is the new version of the mythical training shoe for neutral runners adapted to market trends: about 10% lighter, better breathability and smoother transition, closer to natural one. Upper is composed of lightweight seamless mesh specially designed for more ventilation and comfort which even forces manufacturer's logo to adopt a rearmost position. Still soft feel in the heel thanks to Zoom Air crushpad but it gets harder with Cushlon foam (evolutioned EVA from Nike) in the midsole, which was one of the things runners appointed to be improved in previous Nike Air Pegasus 30. These Nike Zoom Pegasus 31 encourage to a more natural transition thanks to side rails that provide firmness in every stride and also to a more flexible sole with improved grip. A classic ones from parks and races all over the world.